Hybrid (Passive/Mechanical) Thermo Probes combine an internal heat exchanger with the normal two phase convection heat transfer of a thermo probe. 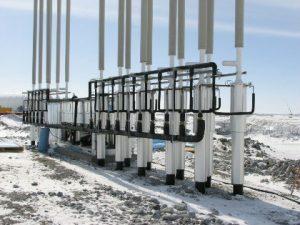 A mechanical refrigeration plant can be connected to the internal heat exchanger to supplement the refrigeration. This arrangement could be used to extend the season when the ambient air temperature is too warm to probide cooling. Hybrid units have been used to create frozen containment soils for hazardous wastes as far south as Tennesse. The hybrid unit provides total two phase heat transfer which is more efficient than sigle phase heat transfer such as a circulating cooled brine. Hybrid units are also being used to initate freezing of dams, subgrade soils during the summer construction season and for maintaining ice surfaces in hockey and curling rinks. Two-phase systems are inherently more efficient than single-phase systems. The heat transfer associated with the liquid-to-gas and gas-to-liquid phase change is thermodynamically more efficient than are the heat transfer attributes of single phase liquids or gasses. Two-phase working fluids, when circulated above ground, are usually liquids at temperatures which lose heat to the atmosphere instead of gaining heat, thereby improving subgrade cooling efficiency. Liquid systems circulate cold liquids which gain heat from the air, thereby wasting cooling capacity. The cooling can be concentrated at predetermined subgrade depths through selective control of the wetted surface. Conventional liquid systems cannot selectively concentrate the cooling to a subgrade location because they experience their maximum temperature differentials near the refrigeration unit above ground. There is no risk that accidental refrigerant leakage will reverse the freezing process. With conventional refrigeration, antifreeze liquids such as brine are not circlulated through the soils. A leak in a two-phase system would actually provide additional cooling. Power outages are of no concern in the application of hybrid thermosyphon technology. A three-dimensional finite element thermal analysis for the Oak Ridge Demonstration project predicted that it would take more than one year for the frozen barrier to toally thaw if the power were cut off. In the case of a realistic power outage (a few hours, or worst case, a few days) the wall would remain virtually unchanged. A simulated power outage of eight (8) days duration reduced the average thickness by 2.5%. For purposes of contaminant control, the most recent and pertinent application was a demonstration project at the Oak Ridge National Laboratory, in which the HRE Reactor Pond was surrounded with a frozen barrier measuring 300′ long, 12′ wide, and 30′ deep. The system was installed during the summer of 1997, and has been operating since August of that year. The data collected continuously since startup indicates that the system is functioning as planned. It is effectively stopping the flow of radionuclide contaminants from the pond and is doing so in a very cost effective, trouble-free manner.